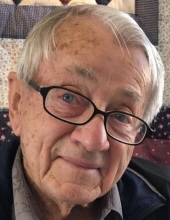 Gerald Joseph Wille “Jerry”, age 91 passed away on February 1st in Lakewood, Colorado, surrounded by family and friends. He was born 5th of 6 children to parents Henry and Magdalene Wille on June 10th, 1927 in Piqua Kansas. Gerald graduated from Iola High School and received his teaching degree from Rockhurst College in Kansas City and his Master’s Degree in mathematics from the University of Wyoming. He served in the Navy in World War II and the Korean War. He married Mary Jean LeValley on June 10th, 1956. “Jerry” was known for his love of his family, being a tremendous math teacher, an avid Rockies and Broncos super fan and his beautiful blue eyes lit up a room. He was an avid sports fan, fisherman and loved to go to the hills to gamble. Jerry is preceded in death by his son Kurt. Survived by his loving wife Mary Jean of 63 years; his son Matt and daughter-in-law Maureen, grandchildren Kristine and Daniel, great-grandchildren Tucker-James and Hunter Finn; his daughter Lisa and son-in-law Mike, grandchildren Eric and Jaclyn and a loving extended family. To send flowers or a remembrance gift to the family of Gerald Joseph "Jerry" Wille, please visit our Tribute Store. Visitation with Recitation of the Rosary at 10:00 AM, prior to the Funeral Mass at the church. Please meet at Staging area B at 1:15 PM for procession to Shelter B at 1:30 PM with Military Honors. Maps will be present at the reception. "Email Address" would like to share the life celebration of Gerald Joseph "Jerry" Wille. Click on the "link" to go to share a favorite memory or leave a condolence message for the family.